My girl friends from NYC came to visit last weekend, and we were intent on getting in all the Fall things! 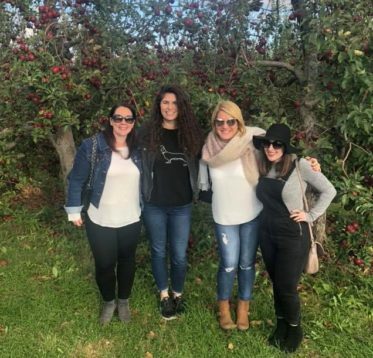 We danced at a party in a barn, we had dinner al fresco around a campfire, and we went apple picking at an orchard outside New Paltz, NY. We bee-lined for the Honey Crisp apples, but Mr. Big also wanted Empires, so we got some of those. Then the Jona Golds looked good, so we got some of those, and before I knew it, we filled all filled our bags and now I’ve got dozens of fresh apples to eat! 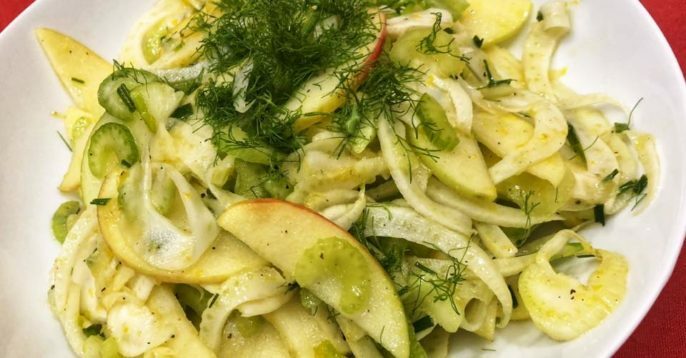 Fresh apples are great, apples with nut butter are great, apples in breakfast hash are great, but this Fennel Apple Slaw might be the best way I’ve prepped apples all week! 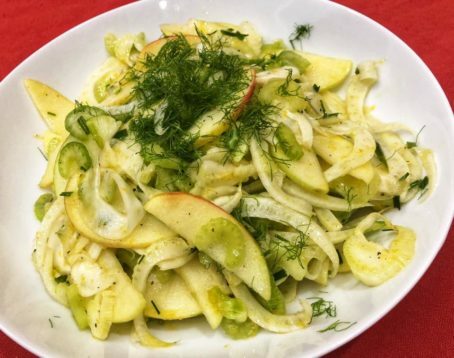 It’s lemon-y, sweet, and then you get the crunch of the fennel and celery – perfection! I combined the ingredients, covered it with saran wrap and let it “get happy” in the fridge for an hour, mixing halfway through. When it was time to serve it, I sprinkled the topped with chopped fennel fronds and some more fresh chives for color. This is SO delicious! What do you think – would you try it? 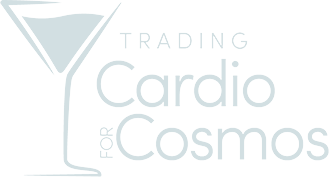 Some of the links contained in this post are affiliate links which means, at no additional cost to you, I may earn a commission if you click through and make a purchase.